Beginning last Friday, the California Dried Plum Board announced a new partnership with Chef’d that will make it simple for people to enjoy cooking at home with California prunes. A meal kit delivery service that delivers pre-portioned, ready-to-cook meals, Chef’d say they are the easiest way to cook like a pro at home. California prunes is the first Chef’d partner to have enlisted a registered dietitian – who is also a chef – to create their meal kit recipes, perfect for kicking off the New Year in a healthy and delicious way. California Prune-Glazed Pork Tenderloin with Sugar Snap Peas – A satisfying dish for the meat and potato devotee looking to add some greens, fruit and flavor to their routine. 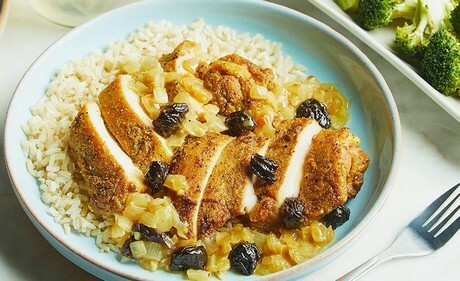 Chicken Curry with California Prunes – California prunes make this dish pop by adding a natural sweetness with no added sugar to this creamy and comforting recipe. Pan-Roasted Cauliflower and Chickpeas with California Prunes and Almonds – A vegetarian dish full of taste and textures to wake up your taste buds. In addition to the new meal kits, thousands of Chef’d customers will experience the taste of California prunes via a "surprise-and-delight" sampling program. As part of the sampling initiative, Chef’d consumers will receive snack packs of California prunes with any Chef’d a la carte meal kit order during early 2018. Later in the year, California prunes will launch three additional registered dietitian-created meal kits featuring lighter fare which they say is perfect for the spring and summer.